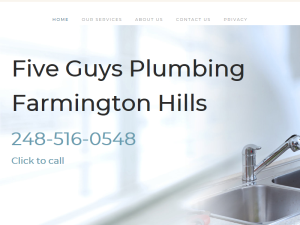 Five Guys Plumbing Farmington Hills offers the best plumbing services in Farmington Hills Michigan. We have been in business for the past 20 years and have gained the reputation as a plumbing company you can trust. Our plumbers are licensed and certified and go through rigorous training to make sure that they are able to handle any plumbing job. We service both residential and commercial customers within, and outside, the Farmington Hills area. Our services include, but are not limited to, clogged drains, pipe leaks, leaky faucets, and plumbing installations. We also provide a 24 hour emergency service for your plumbing needs that just can't wait. No matter the job, or the time of day, Five Guys plumbing Farmington Hills can handle it. Call us today to schedule your appointment!